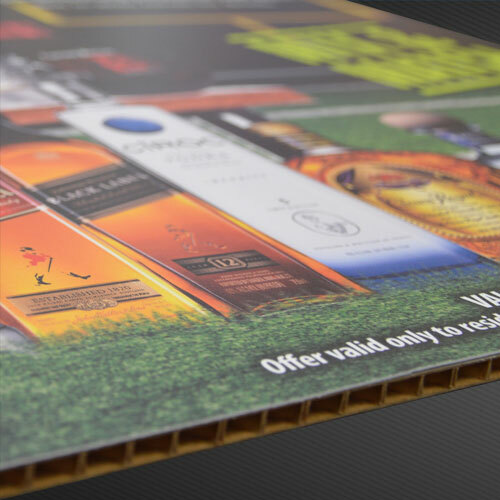 SignCenter offers a huge variety of rigid media for wholesale print production. 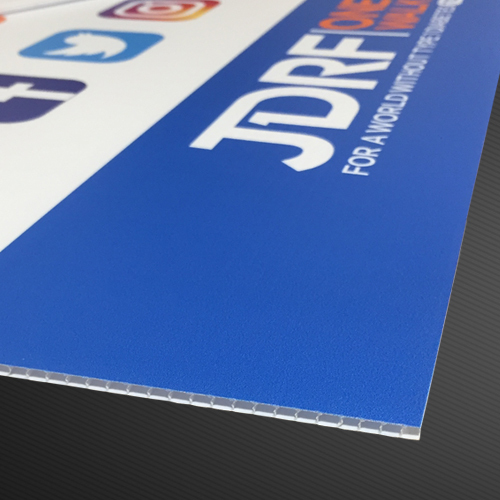 Our board stocks are available in paper, foam, plastic and metal – some in thicknesses up to 1/2″ and some as large as 60″ x 144″. There are options for direct printing, applied prints, die cutting, heat bending and edge finishing for interior & exterior applications. 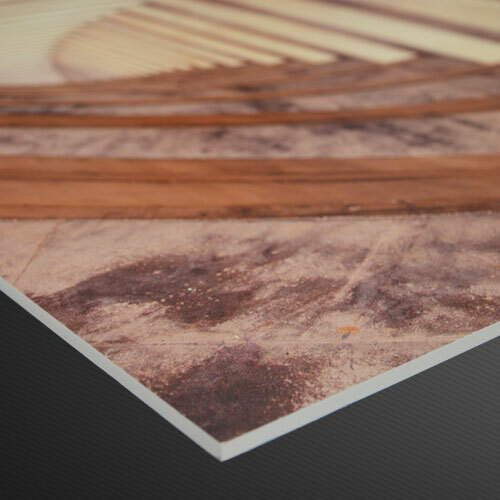 Our paper boards are solid bleached sulfate, (SBS) which is the highest quality paper board substrate. It is produced from bleached virgin wood pulp and has a mineral or synthetic pigment coated surface on both sides. For Indoor Use. Showcard is a standard paper stock. (C2S) Stock thickness (or caliper) includes 12 pt, 18pt, 24pt and 50pt. 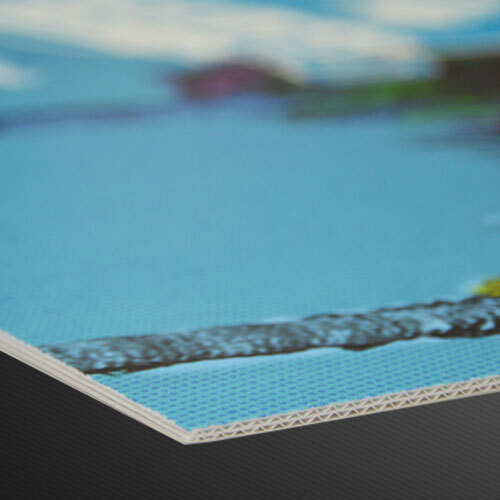 The thinner media can be in either sheets or rolls, while 24pt and up is stocked in 50″ x 99″ sheets. SBS boards are always UV printed and can be 4/0 or 4/4. Corrugated “Kemi” boards have a brown craft center and white print surface on either one or two sides. Typically we will use “B-Flute” which is .125″ or 1/8″ thick, or “E-Flute” which has a thickness of .0625″ or 1/16″ thick. Enviroboard™ has multiple corrugated layers for strength and is white on both sides and though the center. A “green” option, Enviroboard is produced with 10% post-consumer waste and FSC certified fibers, and is 100% recyclable. These boards are 48″ x 96″, 3 mil thick, & UV Printable 4/0 or 4/4 (note: one side has a smoother printing surface than the other). Falconboard® is also a “green” material. 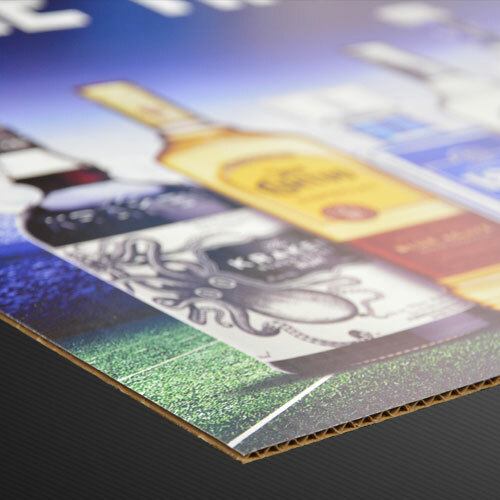 This is a fully recyclable rigid graphics media board which offers superior performance over most traditional foam board options. Its unique paper-based structure can handle the most demanding of graphic board requirements due to its strength, rigidity and dimensional stability. This board has white faces and a brown craft honeycomb core. 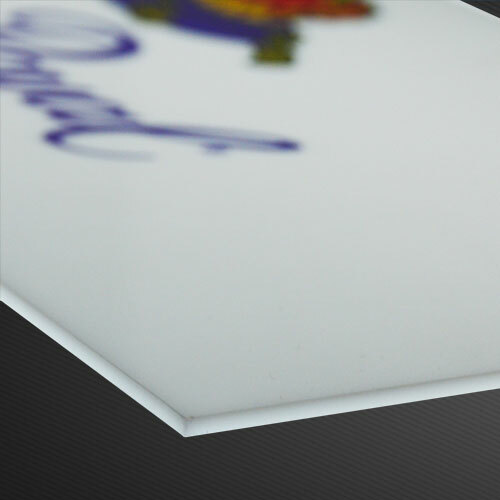 Boards with a foam center have long been a staple of the display and signage industries. SignCenter stocks traditional paper face foamcore, clay faced GatorBoard®, and plastic faced UltraBoard. For Indoor use. Our standard foam board is produced in Connecticut by Gilman Brothers under the tradename Insite® Reveal®. 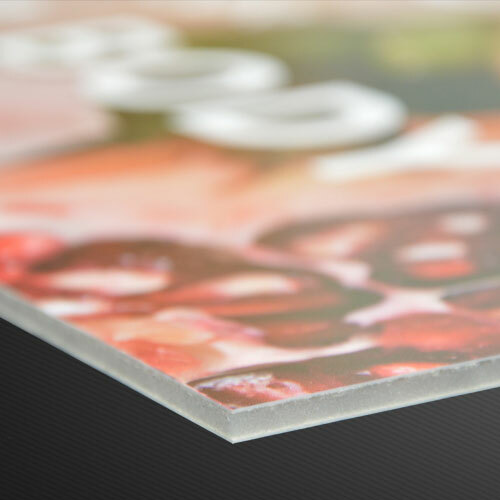 InSite is a high-quality paper faced foamboard manufactured with a proprietary Reveal® foam center engineered to retain its thickness. InSite Reveal features smooth, bright white paper manufactured with a moisture resistant clay-coating for superior ink adhesion and exceptional color gloss. Stock thicknesses are 3/16″ and 1/2″ in sheets as large as 60″ x 120″ and in black or white. Images can be direct printed with photographic quality, or for more critical applications 1200 dpi photo prints can be mounted on these boards. InSite Reveal® is also available in a fire-retardant version by special order. Gatorfoam® is a heavier duty foam board and is comprised of extruded polystyrene foam bonded between two layers of wood-fiber veneer. Made in the USA it is dent and scratch resistant. Its also available in black and in the same sizes as foam board. 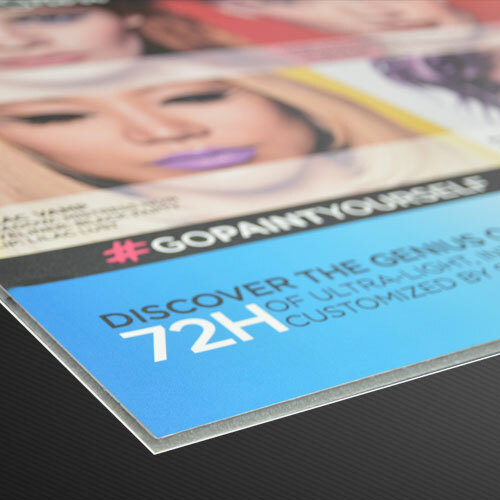 Ultra Board is a heavy-duty, all-plastic panel that features a litho-grade, high-impact polystyrene surface perfect for digital printing. It is ideal for permanent displays and signs. Available with a white or black core with white faces in 1/2″ thickness up to 60″ x 120″. SignCenter stocks Polycarbonate, Acrylic, Hi-Impact Polystyrene (also referred to as HIP or Styrene), Expanded PVC plastic boards (trade names Sintra® and Komatex®) as well as corrugated plastic boards. For Indoor / Outdoor Use. Corrugated plastic, known by the trade name Coroplast, is an affordable option for temporary outdoor signage. SignCenter stocks 4’ x 8’ sheets of 4mm and 10mm corrugated plastic, however sheets as large as 5’ x 10’ are available. The 4mm sheets are available in a rainbow of colors– bright orange is a common choice for construction signs. These signs can be die cut to any shape and various sizes, however some standard sizes are as follows: Yard Sign = 24” x 18”, Political Signs = 48” x 96”, A-Frame Signs: 36” x 24”. Polycarbonate (trade name Lexan® or Makrolon) is a plastic with very high impact resistance. White translucent polycarbonate (3/16″ thick) is the print material of choice for backlit sign faces and can be direct printed with excellent longevity although a UV laminate is recommended to extend the life and protect the art during installation. It is produced on rolls so it is possible to have a very large continuous surface, although at larger sizes, the weight of the panel may become unwieldy. 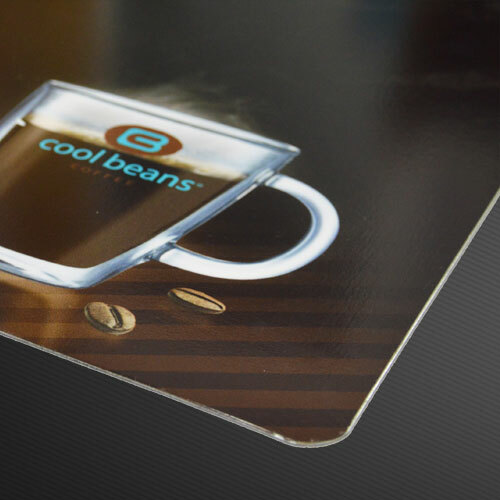 Clear polycarbonate can be printed with CMYK plus white ink and is used widely for interior and exterior displays. 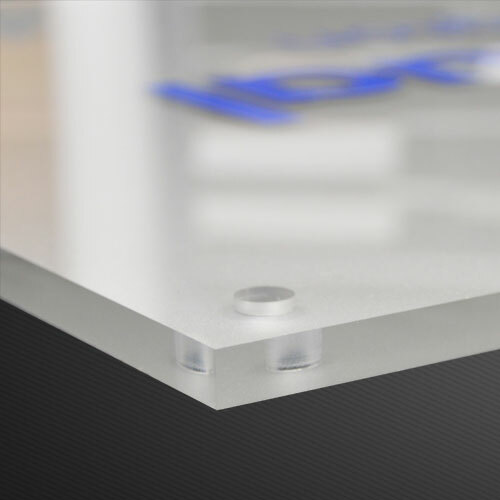 Acrylic (trade names Plexiglass, Acrylite, Polycast) is manufactured using two different processes – extruded and cast. Most acrylic signage is extruded to save costs. Extruded is also the material used for second surface applied graphics because there is less variation in thickness across the panel. Typically 1/8″ or 3/16″ material is used, although it is available in thicknesses up to 1″ (which can get pretty expensive). Clear or white material is used most often with printed or applied prints. 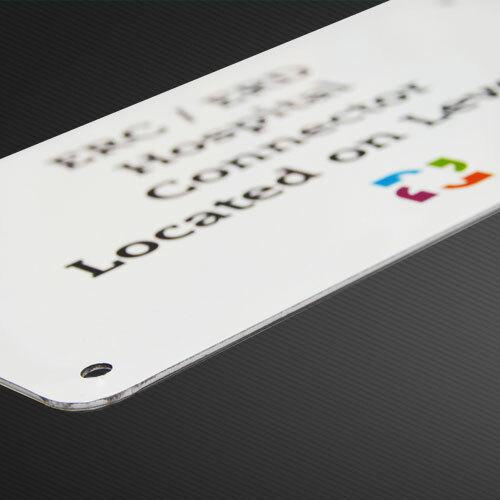 SignCenter can polish the edges of acrylic signs using our diamond edger for straight sides, or hydrogen / oxygen flame polishing rig for curved edges. 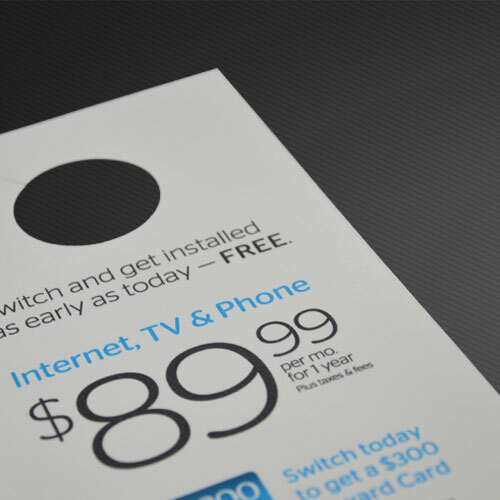 Styrene is a dense material that is excellent for POP/ POS Displays. It is inexpensive, durable and easily die cut. Stock thicknesses are .02″, .03″, .04″ and .06″ in 50″ x 99″ sheets. Also know by the tradenames Sintra™ and Komatex™, the PVC used in the graphics and signage industry is usually Expanded Polyvinyl Chloride which is lighter weight than the PVC used in plumbing pipes and other applications. 1/8” Expanded PVC is available in a variety of colors, thicknesses and sizes and is incredibly versatile. 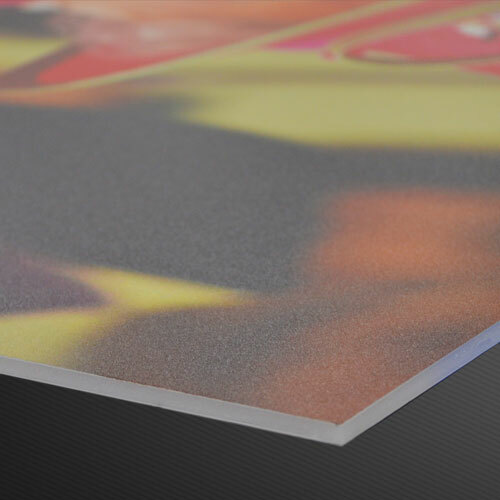 It is a durable, rigid and fire-resistant printing media. SignCenter stocks quality metals for sign production. Depending on the application, there are choices for aluminum, steel or a metal / plastic composite trade named Omegabond®. For Indoor / Outdoor Use. For long term exterior signage, aluminum is ideal – it can be direct printed or supplied with an applied vinyl print. There is a variety of thicknesses depending upon application including .03″, .04″, .063″ and .08″. The most common thickness is .04″ which is available in sizes up to 5′ x 10′ and colors that include black, blue, red and yellow. (colors not available in all sizes). Standard parking signs are traditionally .063 or .080 aluminum and can be produced as reflective graphics if desired. Steel signs are generally only used indoors as a backing for magnetic graphics. SignCenter wholesale printing uses a 26 gauge galvanized steel that can have graphics applied, including graphics with dry-erase laminate for use as scheduling boards.It is recommended that metal signs be specified with a 1/2″ radius rounded corner for safety. Aluminum Composite Panel (ACP) is a lightweight, very rigid and durable printing material is ideal for exterior signage. 3mm (1/8″) sheets are available as large as 5′ x 10′ and 6mm (1/4″ sheets) are produced in 4′ x 8′ and 4′ x 10′. 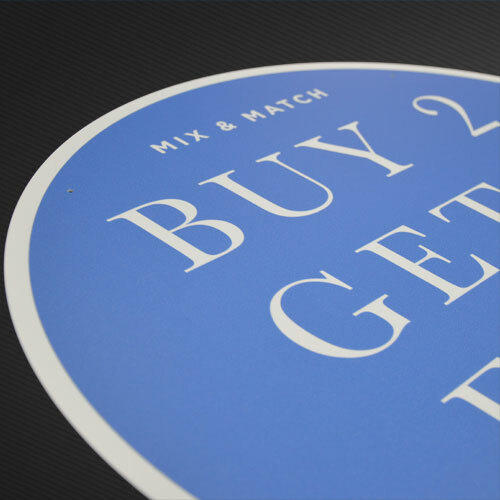 For double sided signage mounted prints are required – mainly to protect from damage before installation. The material is a solid core panel that features double 0.012″ aluminum bonded to a solid polyethylene core making them rigid yet lightweight. 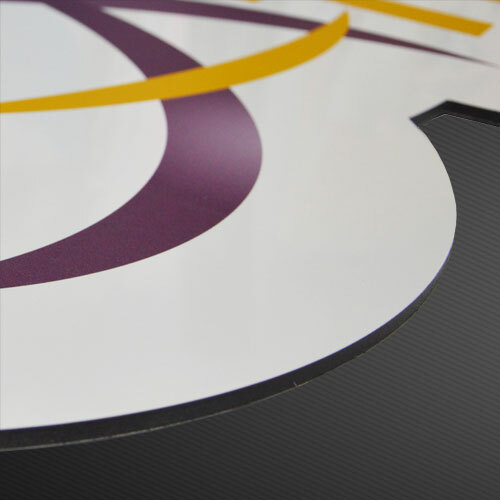 ACP die cuts beautifully with a nice finished edge making in perfect for contour shaped signs. Looking for other Board Options? Check out our Dye-Sublimated Boards! Aluminum, Wood & Steel Options are Available. "I speak for our team when we say that we consider SignCenter as part of our extended team here and you guys were amazing from the expediting of the plaques and reporting what’s been shipped and continue to do so with the same sense of urgency." "SignCenter is a valuable asset for our company. They continually supply us with high quality graphics that are well within our budget. Their work is top notch and produced with a friendly, professional demeanor. We will continue to rely on SignCenter for our future graphic needs." "Absolute BEST in service, products offered and color quality!!!" "Great company – service, product quality, innovation – this is the place!!!!"